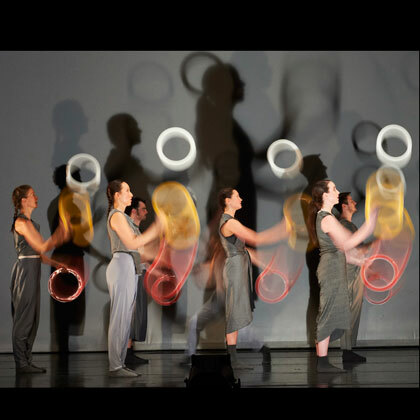 After excursions into ballet with 4×4: Ephemeral Achitectures and bharatanayam dance in Sigma, Gandini Juggling joins forces with Sadler’s Wells New Wave Associate, Alexander Whitley, (Royal Ballet, Ballet Boyz, Rambert, Birmingham Royal Ballet) to take object manipulation and contemporary dance into new territories. Featuring five jugglers and four dancers, with a guest appearance by juggling wonder kid Wes Peden, Spring explores the nature of colour in a kaleidoscope of deconstructed rythmns and patterns. It’s spectacular, fun, funky, complex and performed to an original, ‘baroque meets techno’ score by leading London composer, Gabriel Prokofiev, with lighting by multi-award winning designer, Guy Hoare.